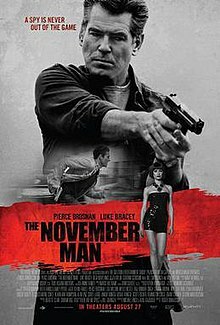 Good to see Pierce Brosnan in a movie again, though since he was one of the executive producers, he was probably thinking along the same lines. Actually I have no doubt he’s done other stuff since I last saw him, it’s just been a long time since I did. He’s looking his age, but it seems to suit him. Earliest thing I remember him doing was an hour long horror thing called the Carpathian Eagle. He was a jogger, a victim to mass murderer who cut out her victim hearts, but I digress. Besides I’m sure he did stuff earlier to that. Ooooh, look what I found. So back to the point, what did I think about the movie? Well, to begin with it was very formulaic. We’ve seen this story several times before, perhaps told in a different way, but nevertheless it felt very familiar. It was therefore easy to make certain predictions. Alice really is Mira… woooo! (not a surprise). The heroes buddy from the beginning to the movie who spend most of the movie chasing said hero changes sides at the end (again not a surprise.) While it might be true that sometimes these movies will end with a showdown between the two buddies, this really didn’t feel like this sort of movie. Even who the real bad guy is shouldn’t have been a surprise. Perhaps it was the fact that I had taken my brain out to enjoy such a movie was tantamount to the fact that this ‘twist’ did actually catch me off guard, but we’ve seen it so many times before that it really shouldn’t have. After being told to use only cash, Alice/Mira uses a credit card at a station, thus alerting the bad guys to her location. ‘Oh,’ I said, ‘she must’ve done that on purpose to lead said baddies into a trap.’ She hadn’t, leading us to wonder why she did such a thing. It fit the movie only that it might have been the only way to get rid of a certain bad guy and those loose ends have to be rounded up and shot. But it didn’t fit the story. When said bad guy has the information she needed, why did she shoot her assistant. I mean, I know it seems to be the standard in hollywood, but she hadn’t yet accomplished her mission, what if she needed him again? And how does one get to be so expert the stuff the guy knew if he was getting shot every time he did any work for anyone? Yep, cliche after cliche after cliche.There were more things, but I don’t want to spend my entire day on this. Overall the movie was entertaining, but it could have been so much better with an original story. It’s not good enough to be given 4 stars while at the same time not quite sinking so low as to be worth a mere 2. Scraping the bottom of the barrel again. Yep I know I said two weeks ago that this wasn’t something I was likely to want to watch (because of the trailer) but there was nothing else on and frankly how bad could a sci-fi movie be? To be honest it wasn’t too bad, none of the characters were particularly likeable, and at least one of the them was irritating until the end sequence. In fact there wasn’t a lot going for this movie at all until the big ending. Problems, well there was the use of shakey cam. Then again it wasn’t so bad that it ruined the movie. Most of the problems I have with it seem to surround the tape the hero listens too throughout the movie. After 26 years it would be virtually worn out. the player would be next to useless, the earphones certainly wouldn’t be in such good condition and where is he getting the doubles A’s from? There are also a number of unanswered questions, but with a number 2 threatened at some time in the future, maybe some or even all those questions will be answered. It was entertaining in it’s way. Would probably have been a better movie if they hadn’t tried to inject weak humour. Okay I actually saw this yesterday, but I didn’t have time to review it then. The beginning felt very like divergent, the young hero is about to be selected for a particular task. He is unusually capable so that no one task would really suit him more than any other. Instead of turning the hero into an outcast though, he is selected to be the next keeper of memories. This is a world where people still commit all kind of criminal acts, but they do them for the sake of the community and aren’t aware of what they are doing because their emotions are taken from them on a daily basis through the use of a special drug. There is more I could say, but I don’t want to get too deep into the minutia or the political overtones . – The world is a kind of utopia where everyone sees everything the same way. 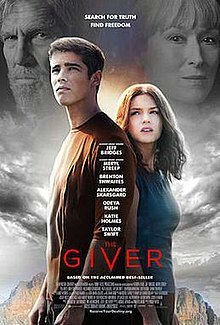 The hero learns along the way that abortion is evil and ends up at the the end of the movie outside the box with a family celebrating religion – definitely an unusual movie for the good people of Hollywood to make knowing what side of the political divide they are usually on. I seem to be getting later in the week. I will try to rectify that. So, we’re scraping the bottom of the barrel today as my wife and I searched hard for something we might like to see. Actually there were three possibilities, Dawn of the Planet of the apes is something I’d like to see, but I’ll wait for it to come on TV. Likewise, Guardians of the galaxy sounded interesting until I saw the trailer (yuk!) so that left Hercules. Hercules has been so overdone in the last few years that I was loathe to suggest it. Nevertheless this is the movie we chose to see. So, take one ancient Greek legend, study it extremely carefully and then tear it up and write something totally unrelated. Well ok, it paid minor lip service to the twelve tasks, turning them into exaggerated bard’s tales. Problems, well it was very predictable. As soon as he was given the job, before we even saw John Hurt on the screen I said ‘ah that’ll be the real bad guy then.’ True I hoped I was wrong, I wasn’t. I suppose I might mention the bit where Boromir single-handly attacked the orcish archers was a little irritating as well. All told though it was actually quite an entertaining movie. Ok, so while it’s not the sort of thing classics are made of, it had plenty of action and the battle scene were handed well with minimal use of shakey cam. I do have one pet peeve. We see this in Hollywood a lot these days, its a mixing of mythologies. 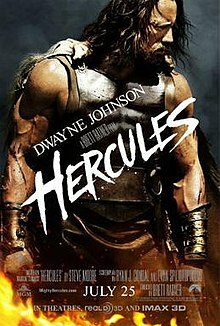 In this movie with have Hercules the son of Zeus. Not Heracles the son of Zeus of Hercules the son of Jupiter, either of which would have worked. Infantes Jubilate -sort of added.